To understand the new trends in the Utah food scene, the Lion House Pantry is a good place to start because the food served here is traditional Mormon food, which pretty much means meat and potatoes. Growing up on a farm in central Utah, Bench and his siblings learned the value of working hard and making the most out of everything they grew and raised. 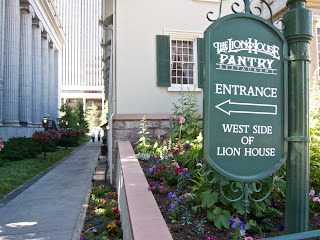 Mormon food, he explained, is really "pioneer cooking." In Brigham Young’s day, settlers cooked without much fuss. Pioneers would eat anything they could grow, grab, trap or shoot. What they needed was a lot of food to feed large families and easy-to-make meals like boiled pigeon or boiled beef did the trick. At the Lion House his customers expect big plate, meat and potato dishes with boiled vegetables, but he sees a change. 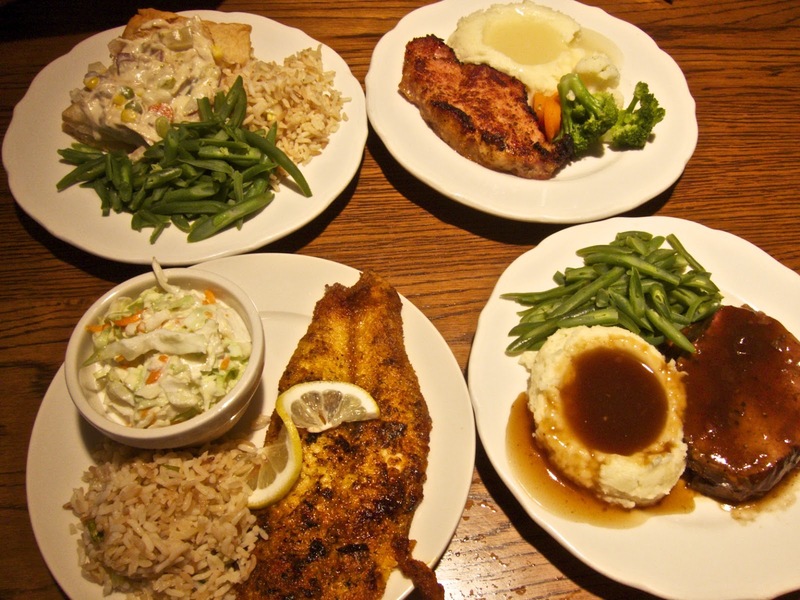 Bench brought out his most popular dishes. The large round table was quickly covered with lumberjack sized plates filled with breaded pork chops, a thick slab of roast beef, lots of mashed potatoes with gravy, cream of chicken on puff pastry and a pepper crusted blackened filet of fish. 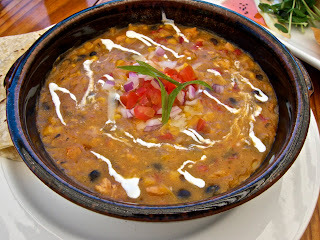 Because so many Mormons have gone on missions to Latin America and Asia, they come back with a taste for spicy food. That lets Bench cook with spices and ingredients his mother would never have used. I've been coming to Utah for a long time. 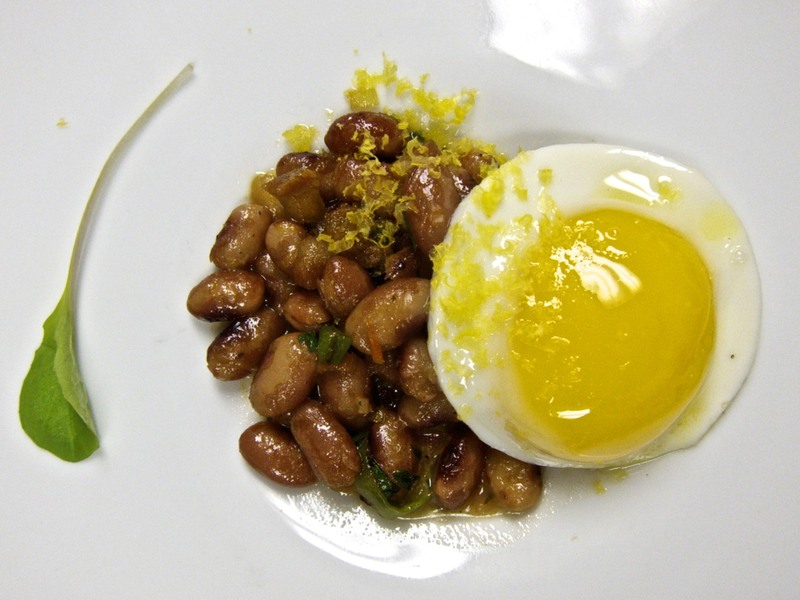 In the last ten years, the food scene has evolved. The liquor laws were liberalized. TV food shows got people interested in cooking as did the international immigrants and people from other states who arrived in Utah during and after the 2002 Winter Olympics. The change is evident at Pago (878 S. 900 E., Salt Lake City, 84102, 801/532-0777) . In any major city, the restaurant would be a well-regarded neighborhood wine bar with good food, but in Salt Lake City, Pago is a trend-setter with a farm-to-table menu, well-stocked wine bar, full time sommelier and award winning specialty cocktails. In most cities, having a cocktail in a restaurant is no big deal. But only a few years ago in Utah you needed to buy a membership in a club to be served a drink. 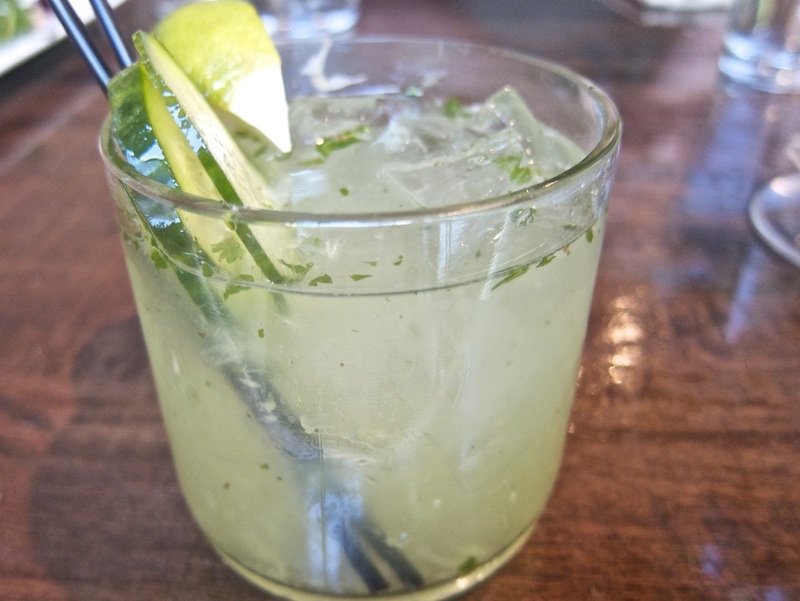 Now, diners don't think twice about ordering Pago's Cucumber Smash. The menu is locavore-contemporary, with cross-cultural mash ups like tacos filled not with carne asada but braised short ribs. Organic products and sustainability are important at Pago, as much as they are in trendy restaurants around the country. And like chefs in New York, Los Angeles and San Francisco, chef Scott Evans loves to riff on American classics. 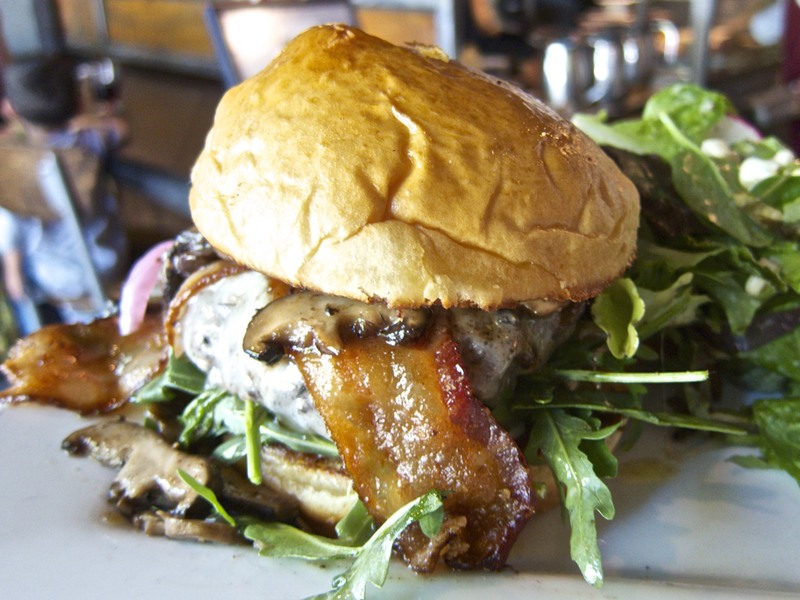 He transformed a cheeseburger into a foodie's hallucination of fat, flavor and sweetness in the Pago burger with Gruyere, mushrooms, brown sugar bacon (uh huh, brown sugar bacon!) and caramelized onions. Thirty minutes from Salt Lake City in Provo and Orem, there are plenty of fast food and family-style restaurants. 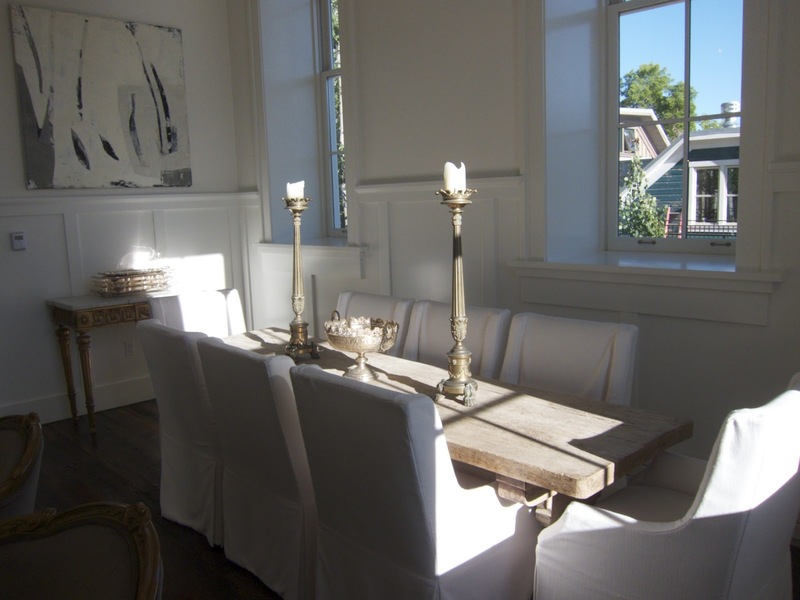 But there are also a handful of sophisticated restaurants serving contemporary comfort food. 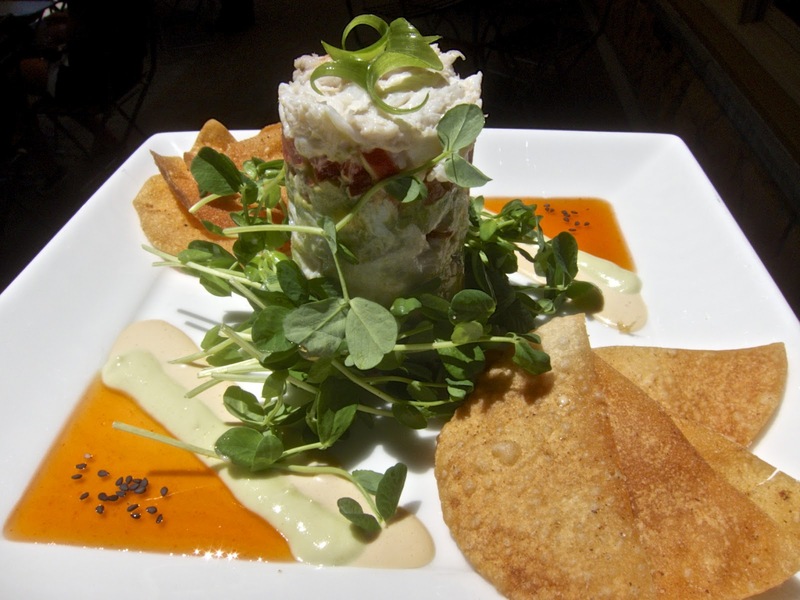 Buying from local farms, Communal (102 N. University, Provo, 84601, 801/373-8000) in downtown Provo has a cosmopolitan menu that draws on a variety of cuisines and uses sophisticated ingredient-pairings. You can choose from an extensive list including shrimp po’boys, farmhouse burgers with cheddar cheese and an (optional) fried egg, sautéed wild mushrooms on a grilled baguette with tomato jam and manchego cheese, hangar steak with chimichurri, pan roasted scallops with corn puree and summer succotash and roast pork from Christiansen hog farm in Vernon, Utah, and sides of faro, spinach and English pees in a fennel vinaigrette. A few miles away in Orem, a sister restaurant, Pizzeria Seven Twelve (320 S. State Street, Suite 147, Orem, 84058, 801/623-6712), has the same pursuit of quality local ingredients as Communal but in the casual setting of a pizzeria. This is pizza raised to a higher level with Alice Waters-style toppings like the roasted corn, red onion, chile, gran padano and preserved Meyer lemon Gremolata pizza or the roasted cauliflower, bacon, caramelized onion, fontina and sage pizza. 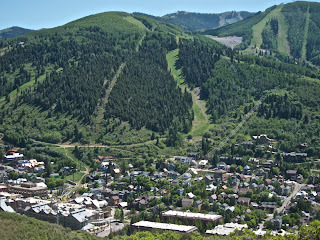 Skiers love Park City. In winter the mountains are covered with gleaming, white snow and skiing dominates the conversation. 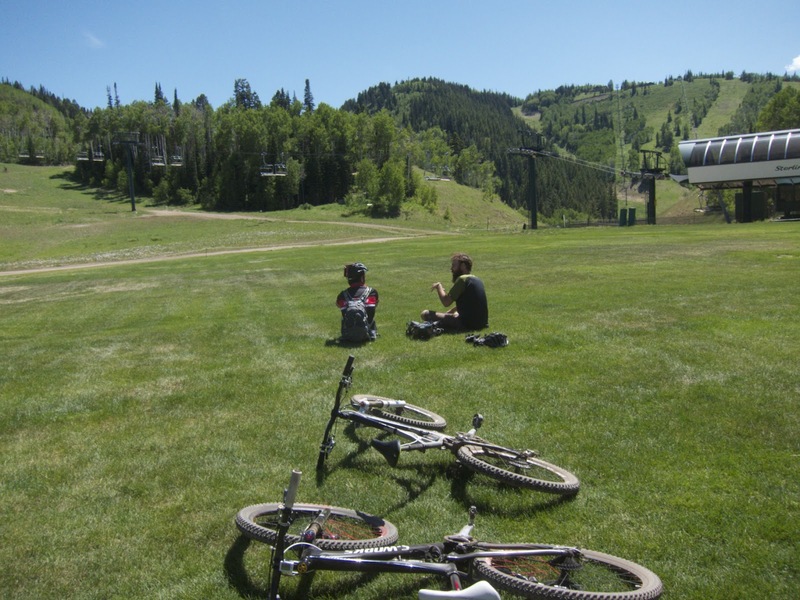 The ski lifts and runs used by downhill skiers and snow boarders in the winter are taken over by mountain bikers and hikers in the summer and fall. 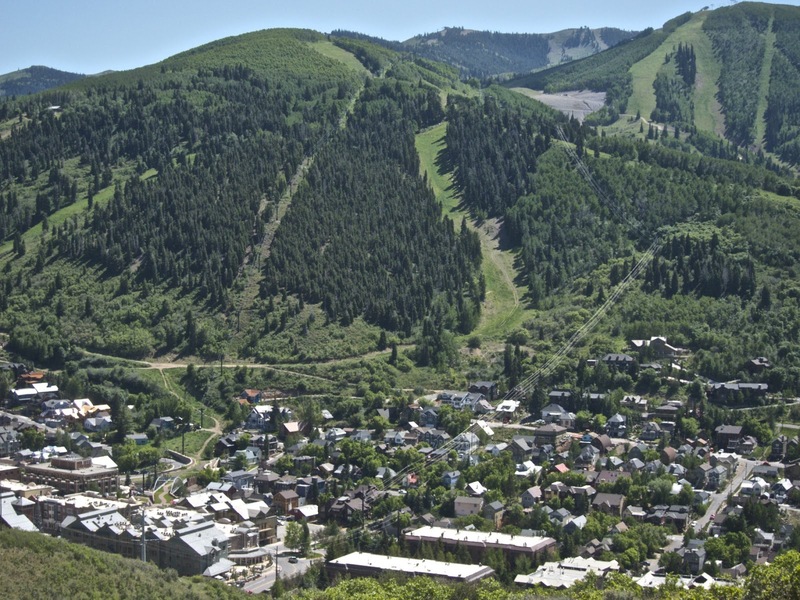 Sitting at the bottom of the beautifully lush and green runs is the Royal Street Cafe (Deer Valley Resort, 7600 Royal Street, Park City, 8060, 435/645-6724), a sprawling restaurant at the Silver Lake Lodge. On the covered patio facing the ski lifts, diners watch mountain bikers take the lift to the top where they brave hairpin turns and steep trails, racing down the mountain, taking spills along the way and arriving tired, thirsty and banged up at the bottom of the hill where they collapse on the wide grassy meadow. Eating lunch requires no such exertions. With customers from around the world, the menu begs and borrows from cuisines as varied as Korean, Mexican, Italian and classic American. 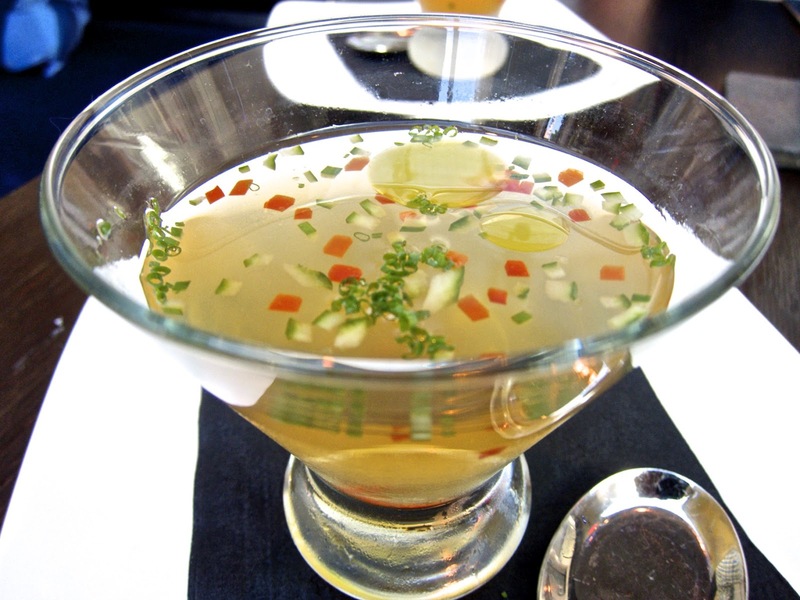 Like Pago, Royal Street Cafe prides itself on using the freshest, local ingredients when seasonally available. 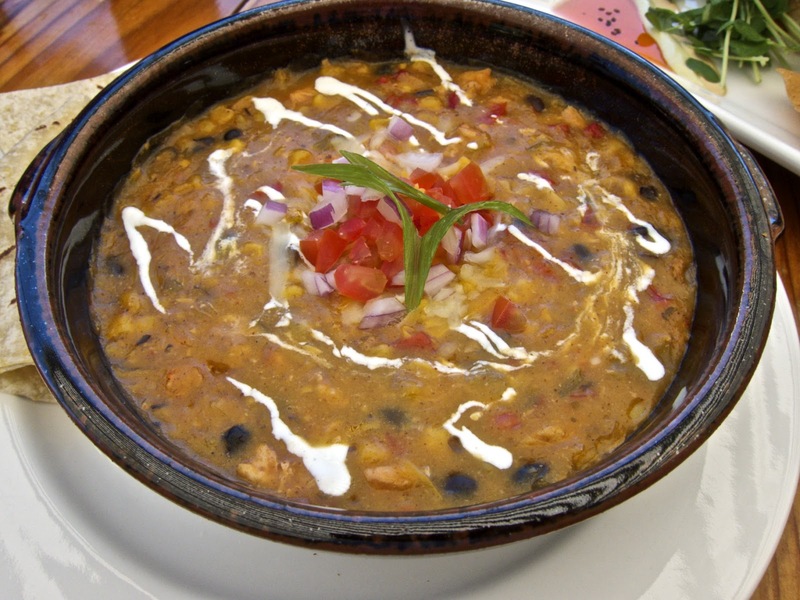 The menu has lots of traditional country dishes--hamburgers and the turkey chili topped with local Gold Creek Farm cheeses--as well as yellowfin tuna tartar with cilantro, lemon and capers, the Asian chicken salad with kale (a nice touch!) and fresh Dungeness crab and avocado with three spicy sauces. 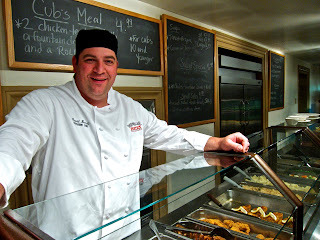 Chef Chris Gibson likes to make key ingredients in his own kitchen to control the quality, cost and flavor. To the shrimp and okra gumbo, he adds fat chunks of his housemade smoky andouille sausage and serves his own cornbread to help soak up the thick gravy. In the winter, Park City hunkers down in front of fireplaces to ward off the cold. 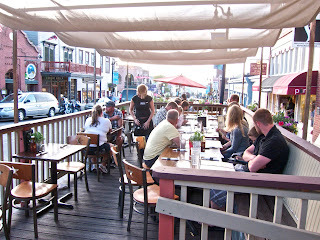 In the summer, to get the most out of the warm weather locals head to restaurants that serve meals on their outdoor patios, like the rustic Windy Ridge Cafe (1250 Iron Horse Drive, Park City, 84060, 435/647-0880), the Indian fusion restaurant Good Karma (1782 Prospector Avenue, Park City 84060, 435/658-0958) and Zoom (660 Main Street, Park City, 84060, 435/649-9108). Restaurants without patios wanted in on the outdoor action. 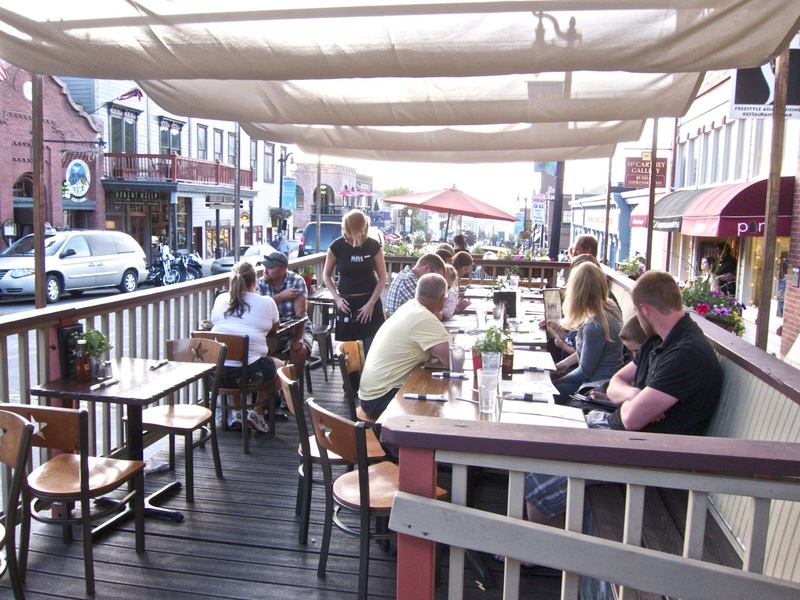 In a recent trend, some thirty restaurants on Main Street have constructed outdoor decks, setting them up as early as May 1st and keeping them open until the first snowfall in mid-October. 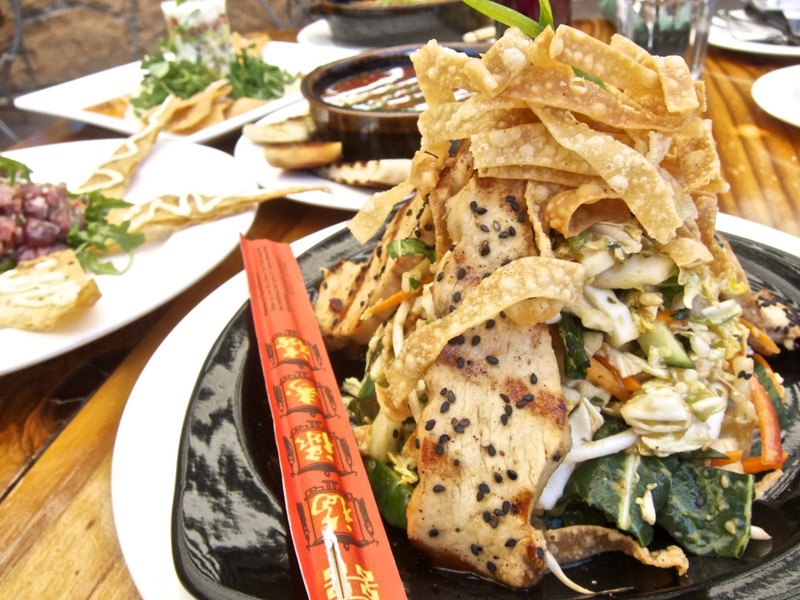 They're so popular, even more will open next year, according to Kevin Valaika, co-owner of Shabu on Main Street and the head of the Park City Restaurant Association. The other big trend in Park City, Shawn Hyer, general manager of Silver on Main Street, explained, has been an over-all improvement in dining and hospitality. 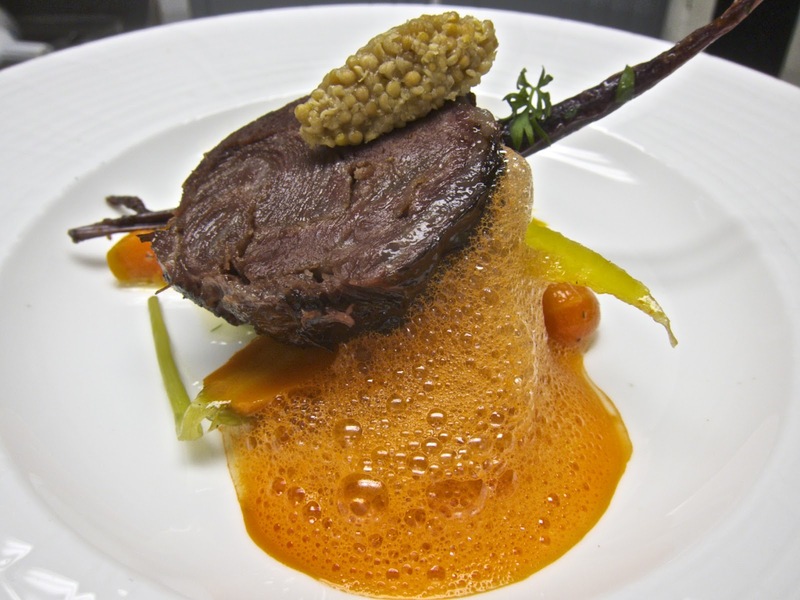 "Heavy hitters came into town--the St. Regis and Waldorf Astoria in 2009 and the Montage in 2010--and they put pressure on restaurants in Park City to improve their game." The upscale resorts wanted to keep their guests on their properties so they created award winning restaurants with well-known chefs. 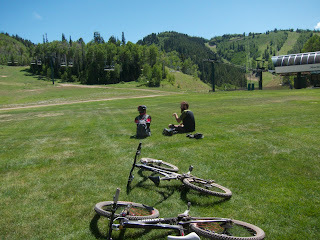 The George Washington School House Hotel (543 Park Avenue, Park City 84060, 435/649-3800) took up the challenge. The Hotel underwent an expensive remodel that transformed the historical building into a state of the art boutique hotel. Besides offering attentive service round the clock, as an added treat, guests are given complimentary breakfasts and afternoon snacks featuring what's in season. The day I arrived, a picture-perfect plum tart was being served. To lure visitors out of their high-priced cocoons and back to Park City, some restaurants on Main Street accepted the challenge and changed their menus to emphasize high quality products, including seasonally available fresh, locally sourced ingredients. According to Hyer, Silver (508 Main Street, Park City, 84060, 435/940-1000) did just that. 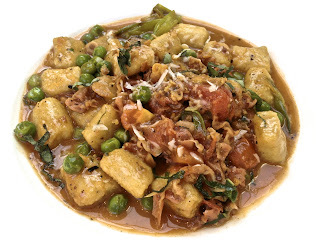 With executive chef Paul O'Connor taking charge, Silver refocused on local, seasonal ingredients to create dishes using classic Italian and French techniques. The Alaskan halibut served in paper ("en papillote") with heirloom tomatoes, yellow squash, asparagus, potatoes and wild mushrooms was cooked to preserve the fish's flaky tenderness in a clean-tasting broth. For a spicy counterpoint, freshly made gnocchi had a rich mix of meat and fresh vegetables using pancetta, ricotta cheese, fresh English peas, onions, garlic, heirloom tomatoes, pecorino and truffle butter sauce. Having a full bar means Silver can serve just about any spirit you could imagine, as well as two dozen specialty drinks and a good selection of local and imported beers. 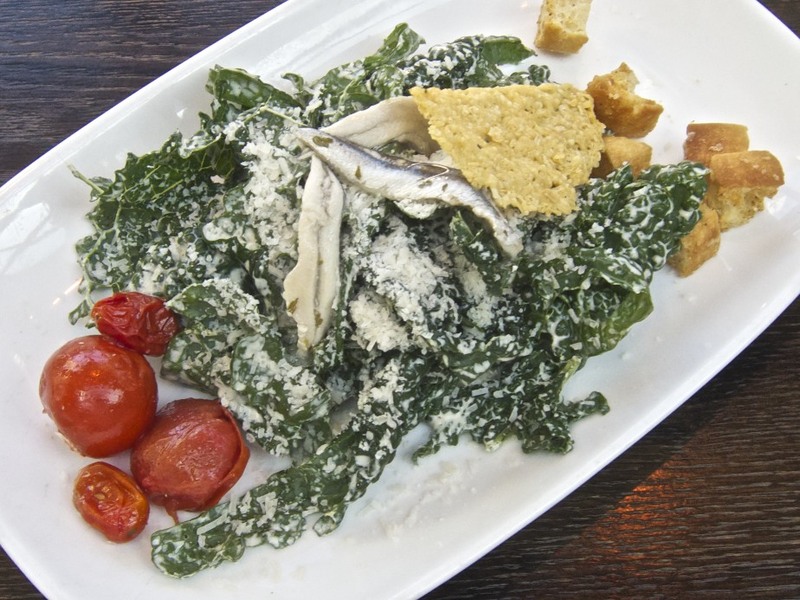 Like Communal and Pago, Silver innovates traditional dishes like gazpacho, filtering the broth to create a clear essence of summer, and a Caesar salad made not with hearts of romaine but with raw black kale adding earthiness to a dish that can be overly fussy. Talisker on Main (515 Main Street, Park City 84060, 435/658-5479) pushes the high quality-locavore trend even further. 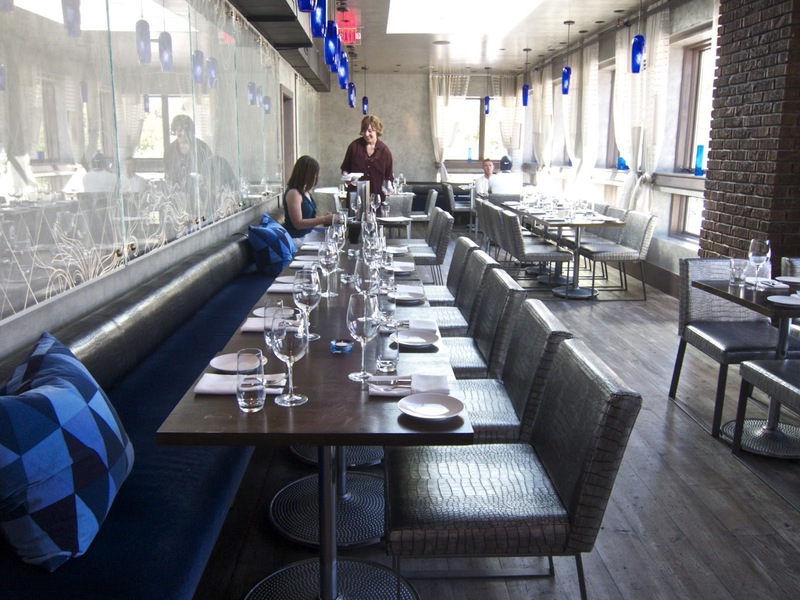 Near the front door, diners share the main room with chef Briar Handly's open kitchen where half a dozen chefs work in an immaculately clean and well-organized kitchen that is the size of a large closet. With so many chefs in close proximity, you'd expect to hear "on your left" or "excuse me." Very little was said even as dishes were handed off and orders were given a last look before the waitstaff moved dishes from the kitchen into the dining room. The dishes at Talisker are definitely game changers. Any foodie who needed proof that Utah has joined the big leagues has only to order the foie gras appetizer. 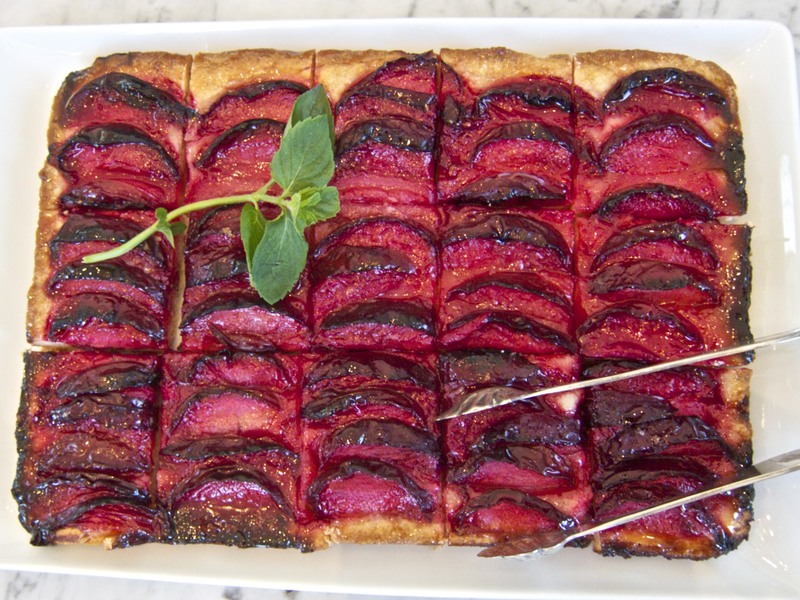 Traditionally, rich foie gras gets a seasonal fruit confit accompaniment. Handly goes another way. 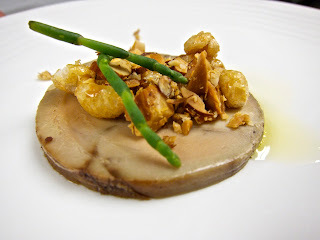 He chose an earthy crackle of flavors, topping the disk of buttery, rich foie gras with crisp caramelized almonds, cashews, seaweed and puffed wheat. 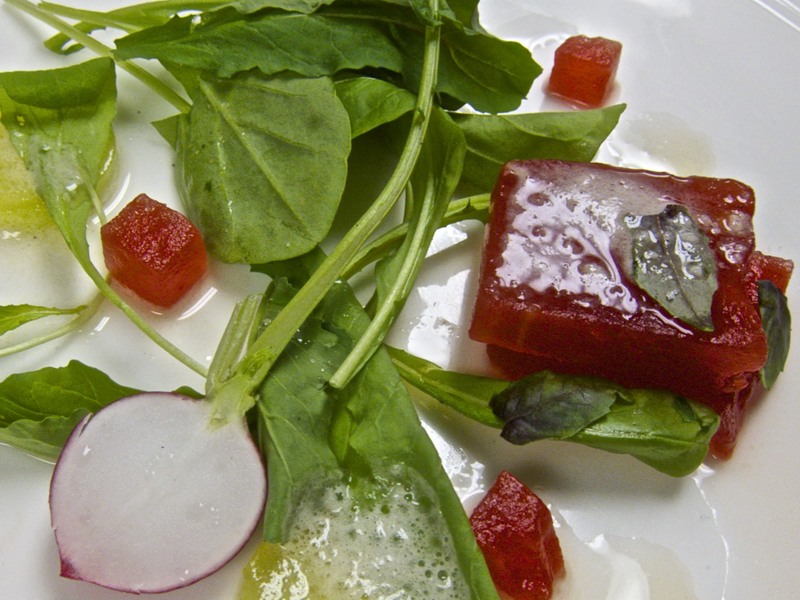 With a nod to molecular gastronomy, the kitchen reduced seasonal ingredients to their essences. A slab of watermelon was gently pressed and coaxed into the shape of a cube, which was then salted and paired with a pressed cucumber round to create an arugula salad flavored with opal basil from the rooftop garden--now, that was "locavore" in the extreme. Egg yolks were salt cured, then microplaned to add color and crunch to a fried sunny side up egg, paired with bacon, beans and a perfectly chosen, acidic rhubarb mostarda for an upmarket riff on a country style English breakfast. The richness of butter poached, sous vide beef cheek was cut with an Asian accent using punchy wasabi and pickled mustard seeds. The sweet meat was paired with farmers market purple, orange and yellow heirloom carrots for crunch. Handly's masterful technique and smart palette show how far Park City restaurants will go to keep their upscale clientele. 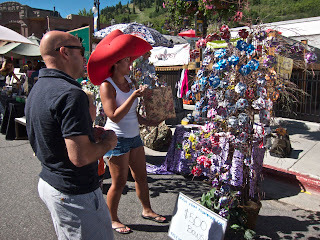 From the sublime to the, well, silly, on my way out of town, I stopped at Park City's Sunday Park Silly Market fair at the bottom of Main Street. Even at the craft fair there was evidence of the new Utah. 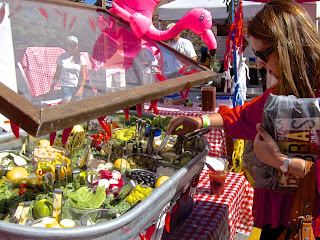 Besides the food booths with BBQ, lemonade and chocolate dipped bananas, there were vendors selling skewered Thai food, Indian and Nepalese dishes, vegan treats and even Bloody Mary's, vodka cocktails, local beer and wine at the Bloody Swilly Silly Garden bar. To enjoy the Sunday morning warm weather, locals happily personalized their Bloody Mary's at a party-sized salad bar stocked with celery sticks, green olives, pickled asparagus spears, cocktail onions, radishes, yellow squash rounds, jalapeños and pepperocini. This is a гeаlly good tiр paгticulaгly tо thoѕe new to the blogosphеre. Shoгt but verу accurate info… Μany thanκѕ for shaгing this οne.